Have you decided to pursue a custom software development project, but don’t know where to look for help? If so, we can understand the challenges and dilemmas you are facing. We often work with business leaders who see the value of bringing scheduling, marketing, and automation tools online, but don’t know enough about the specifics of web programming to evaluate different firms and proposals. 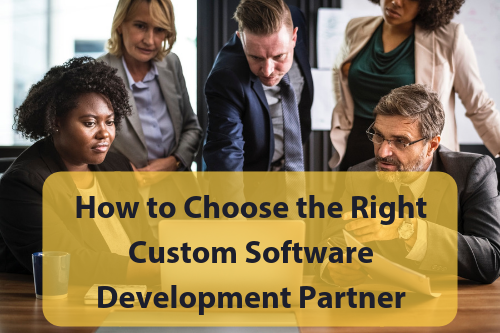 The start of your custom software development project isn’t finding the right company to work with, it’s deciding what it is you want your vendor to create for you. Make a list of features and functions that can help your business, and work from there. This part of the process might involve brainstorming, and even checking out some colleagues or competitors. To be sure, your creative team might have additional input or suggestions later. However, things work best if you go into your search with a rough sense of what you want to get from the finished project. Once you have a good idea of what you would like a creative team to code for you, it’s time to check out different firms and their capabilities. The best way to do that is by examining samples and case studies. When you’re looking at examples of a creative team’s work, it’s natural to focus on visuals and design elements. Make sure you get past the obvious, though, and see whether the custom software they’ve built in the past are functional, stable, and profitable. You aren’t just looking for the right artistic designs, but a track record of success. Every custom software development project is different, but one thing we can safely say is that there are always hiccups and unexpected turns along the way. When the unknown jumps in out of nowhere, an experienced web programming team can help you stay on track and within budget. Naturally, a creative team with many years of experience isn’t going to be the lowest cost option. They are going to be known for helping companies to solve problems, and that means higher project fees. However, this is an area of your technology budget where you probably don’t want to sacrifice quality of work to save a little bit of money. Want to Work With the Best Custom Software Development Team? We firmly believe that anyone who’s looking into custom software development should follow the steps we have outlined in this article. We also believe that any serious business person who does so is going to end up seeking out a creative team like the one you would find at WebRevelation. With dozens of successful custom software projects under our belt, and offices in San Antonio and Oklahoma City, we have the skills and tools needed to complete projects large and small. Why not contact our team today to see how easy it is to get the best minds in the business working for you?